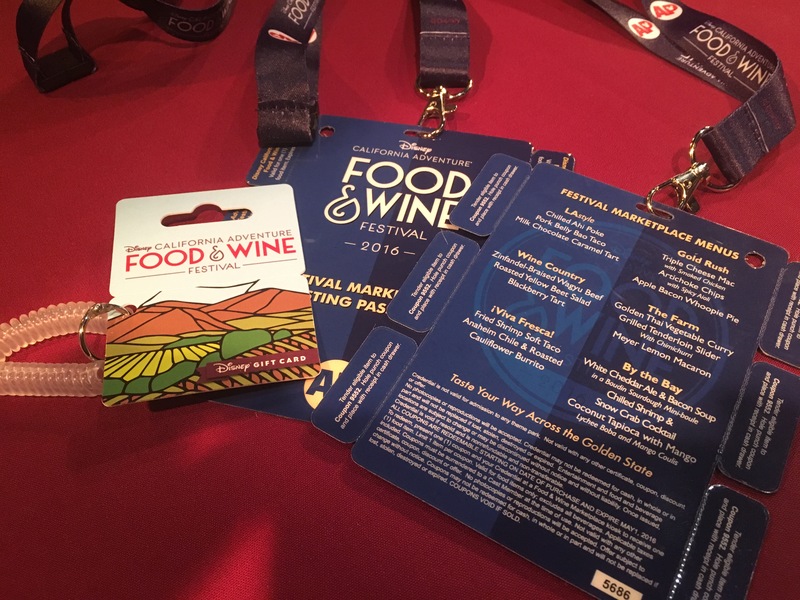 There is a LOT to take in at the Disney California Adventure Food and Wine Festival! With all of the culinary demonstrations, lifestyle seminars, beverage seminars and the Celebrity Kitchen, you could spend most of the day just watching different shows hosted by professionals. Most of the demonstrations are free with the exception of the Celebrity Kitchen where you get the opportunity to watch a “90-minute culinary showcase as your chef du jour demonstrates some of their favorite recipes, introduces you to new cooking styles and shares treasured tips, secrets, stories and more.” Straight from the Food and Wine Festival Guide. But if that’s all you did, you’d miss out on some other great stuff! Disney also features select merchandise for the event including a clever plastic wine and sampler platter (with a hole to support your glass as your noshing on food), shirts and hats with nice, simple, elegant designs, and an apron in burgundy which I just had to have. 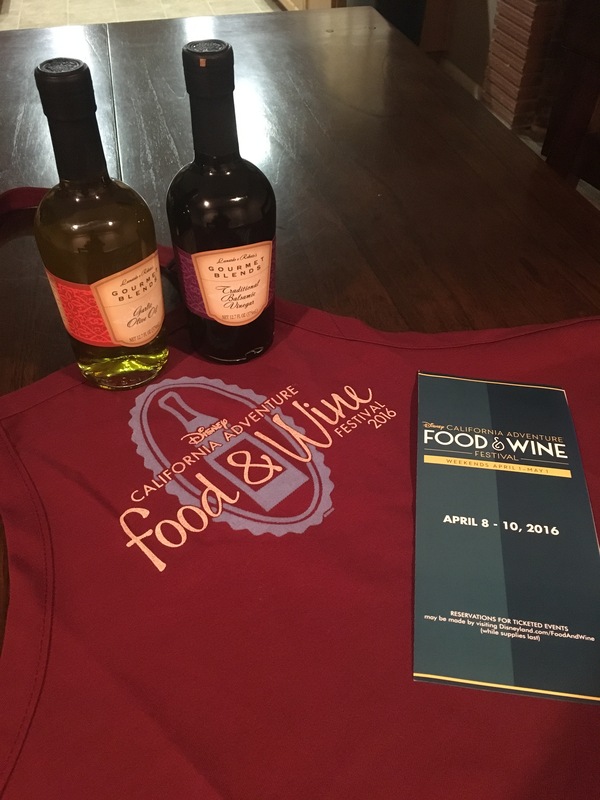 There was also a beautiful wine glass with the logo printed on it, and for those of you who are gift card collectors, they had cute gift cards you could wear on your wrist with an exclusive DCA Food and Wine Festival design. In addition to the Disney branded merch, there were also vendors with specialty food and wine products available for sale. We ended up buying a fantastic bottle of balsamic vinegar and garlic olive oil from a nice gentleman who let us sample pretty much anything we wanted. Annual Passholder Perks! Available at Blue Sky Cellar is an AP Tasting Passport which comes on a nicely designed AP exclusive Food and Wine Lanyard and gives you 6 dishes of your choice from any stand (food only). If you’re going for one day, I would say it’s probably more worthwhile to purchase the food at the stand rather than pay the $39 for the passport unless you just really want the passport. The price was erroneously quoted as $45 in the LA Times but even with a $6 savings, you’ll likely pay less at each stand (and how that reporter walked away not stuffed to the brim is beyond me if he really tried every dish). Even if you don’t get the passport, stop by the Blue Sky Cellar anyway as every AP gets an exclusive button for the event for free! Passholders also have the opportunity to purchase an exclusive AP souvenir shirt (which can be purchased at the Studio Store in Hollywood Land, too). And finally, Passholders can also purchase VIP experience tickets to the Celebrity Kitchen events where, in addition to premium seating, they also get to meet the chef for autographs and receive an exclusive gift. But what about the food? Read about that in part 2! Celebrity Kitchen costs $99 per performance and must be reserved in advance. AP VIP Experience tickets are $149. They are only held on Saturdays at 1pm and 5pm and you can check the website for availability. There is also a very special event with Disney Legend Kurt Russell on April 16th at 1pm, but that show is a whopping $199 extra after admission to the park.